Hours after a mass shooting at a synagogue in Pittsburgh that killed at least 11 people, President Donald Trump gave a political speech at the Future Farmers of America Convention. 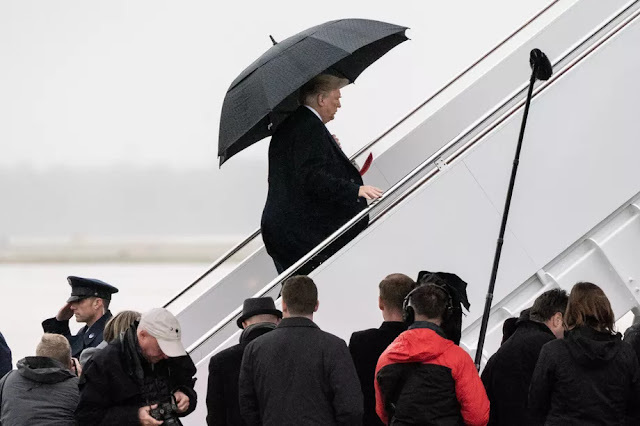 During the speech, Trump, unprompted, discussed how his hair was ruined earlier in the day when he had to stand outside in the rain by Air Force One answering questions about the shooting. “By the way, somebody just said your hair looks different today,” Trump said in Indianapolis. "I was standing under the wing of Air Force One doing a news conference earlier this morning, a very unfortunate news conference, and the wind was blowing and the rain and I was soaking wet and that's what I ended up with today," he added. As the crowd laughed, Trump said that he mentioned the possibility that he should “cancel this “arrangement because I have a bad hair day." While speaking at the event, Trump also confirmed that his rally scheduled for later in the day in Illinois would go ahead despite the deadly shooting. I'm sure they'll all have a lot of fun.